Laurinaitis made his debut in November 1982, competing as The Road Warrior using a biker gimmick. After only a few matches as a singles competitor, Joe’s career and life would change forever thanks to an idea by Paul Ellering. When Paul Ellering was looking to put together a stable of heels in Georgia Championship Wrestling called "The Legion of Doom", it was decided to put Laurinaitis together with his good friend Mike Hegstrand and change their names to "Animal" and "Hawk" respectively. Thus, the Road Warriors were born. They first started out as biker gimmicks; on The Road Warriors DVD, Animal said he felt like one of the Village People. To look more intimidating, the two shaved their heads into Mohawks and started wearing studded dog collars, spiked shoulder pads, and face paint. The look and name were taken from Mad Max 2, helping to paint the two as no-mercy monsters. Their interview style was vicious, yet charismatic and a bit humorous. The team was an instant hit, revolutionizing the tag-team scene with their power moves, no mercy attitudes, and innovative face paint that would spawn many future imitators in wrestling. In Georgia, they won the NWA National Tag Team Championship four times before moving on to bigger promotions, such as the American Wrestling Association in the US and All Japan Pro Wrestling, winning more tag team titles. Their hard hitting style, no nonsense attitude, and winning ways made the Road Warriors fan favorites. Even when they were booked as heels, the fans refused to boo them. They started to split their time between the AWA and the National Wrestling Alliance until finally leaving the AWA for big money contracts with the NWA and a huge push for the monster duo. The move paid off instantly as they won the inaugural Jim Crockett, Sr. Memorial Cup Tag Team Tournament and feuded with the top stars of the NWA such as The Four Horsemen and the Russian Team (which included the Road Warriors' old training buddy Barry Darsow). During their initial run in the NWA, they helped popularize the WarGames match, the Scaffold match, and their trademark Chicago Street Fight. In 1988, the Road Warriors engaged in a violent feud with The Powers of Pain (The Barbarian and The Warlord) the first team that could truly match the Road Warriors in power (and who were one of the most well known Road Warrior clones). The Powers of Pain even went so far as to injure Animal's eye (kayfabe) during a weightlifting competition. When Animal returned, he initially wore a hockey goalie mask to protect his eye. The angle abruptly ended when the Powers of Pain left the NWA after finding out they were booked against the Road Warriors in a series of Scaffold Matches and they did not want to get hurt by falling off the scaffold. Near the end of 1988, the Road Warriors captured the NWA World Tag Team Championship from The Midnight Express whom they mauled in short order to win the titles. After being the "Uncrowned champions" for a long time the Road Warriors' run with the tag team titles was short lived. Teddy Long used a fast count to cheat the Road Warriors out of their titles. In their last year with the NWA, the Warriors feuded mainly with The Varsity Club, The Samoan Swat Team, and The Skyscrapers before leaving the NWA in the summer of 1990, due to conflicts with Jim Herd. The Road Warriors immediately signed with the World Wrestling Federation (WWF) in 1990 and were pushed into a feud with the most famous of all "Road Warrior Clones", Demolition, a group which included their old training partner Barry Darsow. Due to the ailing health of one of Demolition (Bill Eadie/"Ax") he was replaced by Crush but the magic of the original Demolition was gone and the feud did not live up to the high hopes of the fans. Just over a year after signing with the WWF, the Legion of Doom won the WWF Tag Team Championship and held it for about 8 months. When they lost the titles, they briefly left the WWF, only to return with longtime manager Paul Ellering by their side, as well as a wooden ventriloquist dummy called "Rocco". Both members of the L.O.D. thought the Rocco gimmick was stupid, and it led to Hegstrand walking out of the WWF immediately following SummerSlam 1992, leaving Laurinaitis on his own for the first time in 9 years. Animal went ahead and finished his contractual obligations with the WWF, as a singles wrestler and occasionally teaming with former rival Crush, formerly of Demolition. During a handicap match in Japan against the Beverly Brothers in September 1992, Laurinaitis legitimately injured his back from a botched double suplex and had to take a lengthy hiatus. Laurinaitis made some non-wrestling appearances in WCW in 1993. On August 18, at the Clash of the Champions, Animal made his appearance, getting out of a black Camaro Z28 indicating his partner Hawk was Dustin Rhodes' mystery partner against Rick Rude and The Equalizer. On September 19, at Fall Brawl, Animal was the advisor for Sting's team, consisting of Sting, Davey Boy Smith, Dustin Rhodes, and The Shockmaster for WarGames, defeating Big Van Vader, Sid Vicious, and Harlem Heat. On January 4, 1995, Animal seconded Hawk in his match against Scott Norton in New Japan Pro Wrestling's annual Tokyo Dome show. For the next couple of years, Laurinaitis stayed out of the wrestling ring, collecting on an insurance policy from Lloyd's of London while Hegstrand competed all over the world. Near the end of 1995, Laurinaitis' back had finally recovered enough for him to return to active competition. Three years after everyone thought the Road Warriors had ended, they reunited and signed a contract with World Championship Wrestling. Upon their return in January 1996, they immediately started a feud with the Steiner Brothers, who returned in March, and Harlem Heat, before moving on to challenge the WCW Tag Team Champions Sting and Lex Luger. The Road Warriors had several shots at the champions but never won the title in the six months they were with the company. The Steiner Brothers also arrived shortly after the Warriors did, and feuded with them to try to prove who the best team of all time was. The Steiners got the better of the feud and the Warriors left WCW in June 1996. After leaving WCW they returned to the WWF where the Legion of Doom took part in the Stone Cold Steve Austin vs. the Hart Foundation feud, siding with Austin against the Harts. The Legion of Doom also became two-time tag team champions on October 7, 1997, when they defeated The Godwinns. In November 1997, the Legion of Doom faced the newly formed New Age Outlaws (Road Dogg and Billy Gunn) and lost the titles to the upstart team. After several unsuccessful challenges the L.O.D. were repackaged as Legion of Doom 2000 with manager Sunny, although she did not stay with the team for long. At the same time, Paul Ellering returned, but sided with D.O.A., whom L.O.D. were feuding with at the time; Ellering and Animal explained on the Road Warriors DVD that it was hard for Ellering to work with another team against the Road Warriors and difficult to rip on his former team on promos. In 1998, the Legion of Doom became involved in their most controversial angle; playing off Hegstrand's real life drug and alcohol problems. Hawk started to show up drunk or "unable to perform" on TV. As Hawk proved more and more erratic and unreliable, a third L.O.D. member, Puke, was introduced to team with Animal while Hawk dealt with his personal issues. The storyline ended with accusations that Puke had been the "enabler" of Hawk's problems, exploiting them to take Hawk's place in the team. During the controversial segment, Hawk was shown to have fallen off the Titan Tron. Neither Hegstrand nor Laurinaitis approved of the WWF exploiting Hegstrand's personal problems, which caused them to subsequently leave the WWF. While the Road Warriors never officially broke up, Animal started making an increasing number of solo appearances after they left the WWF as Hegstrand struggled with drug and alcohol addiction. 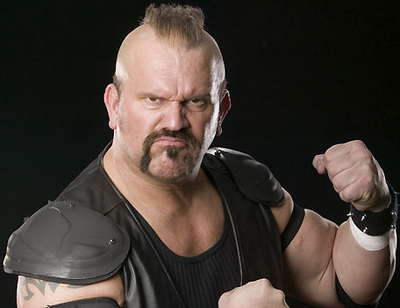 In 2001 Animal landed a prominent position in WCW as the "enforcer" of the stable known as The Magnificent Seven with the objective to protect WCW World Champion Scott Steiner. Laurinaitis most likely landed the high-profile role thanks to his brother John who had a powerful behind-the-scenes role with the company. The Magnificent Seven split up shortly before Vince McMahon purchased WCW; Animal's contract was not one of the contracts the WWF picked up. The Road Warriors appeared in Total Nonstop Action Wrestling in late 2002-early 2003 as part of a group that opposed Vince Russo's faction Sports Entertainment Xtreme, but would only wrestle one actual match for the promotion. 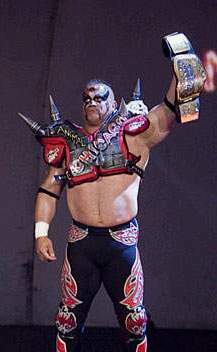 On June 17, 2007, Road Warrior Animal returned to Total Nonstop Action Wrestling on the pay-per-view, Slammiversary, with Rick Steiner; he replaced Scott Steiner, who was out with an injury. They ended up losing to Team 3D. Animal and Hawk made a surprise appearance on RAW on May 12, 2003 when they took on Kane and Rob Van Dam for the World Tag Team Championship. Although Hawk and Animal came up short in their attempt to become three-time champions, it was clear that Hawk had defeated the demons that had once kept him from competing, and the Road Warriors had hopes of returning to WWE. However, Hawk died on October 19, 2003. Animal made a return to WWE on the July 14 episode of SmackDown! in 2005, where he was challenged by the then-WWE Tag Team Champions MNM to a title match at The Great American Bash. Finding a new tag team partner in Heidenreich, Animal went on to defeat MNM for the titles, dedicating the win to Hawk by saying, "Hawk, this one was for you, brother!" The two would team up for a few months in a new chapter of the Legion of Doom, with Heidenreich adopting the L.O.D. 's shoulder pads, face paint, and mohawk haircut. However, this came to an end with Heidenreich's release from WWE on January 17, 2006. On the March 3, 2006, episode of SmackDown!, Animal teamed up with Matt Hardy to face MNM. After he and Hardy lost the match, Animal turned heel for the second time in his career by attacking and injuring Hardy's knee. Animal reasoned that he had realized that Hardy and Heidenreich were screw-ups and that Road Warrior Hawk was the only tag team legend and partner for him. 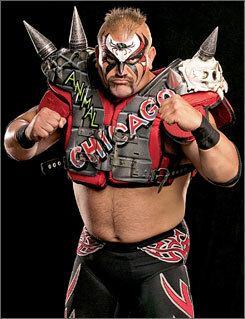 After the heel turn, Animal, once again known simply as The Road Warrior, would drop many aspects of the well-known Road Warrior gimmick, losing the face paint, and shoulder pads. Animal's look at this time was similar to his old Road Warrior gimmick in the early 1980s he had prior to teaming up with Hawk. In his final WWE appearance, Animal defeated Paul Burchill on the May 6, 2006, episode of Velocity. On June 26, 2006, Animal was released from his WWE contract. 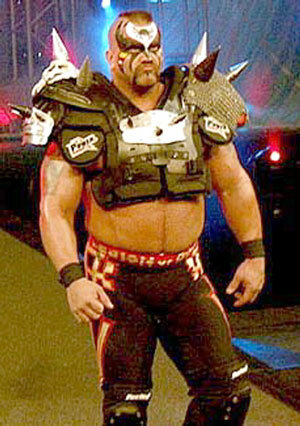 WWE announced on March 28, 2011 on WWE Raw that the Road Warriors would be inducted into the 2011 Hall of Fame. Animal also spoke openly about his future induction on Right After Wrestling just minutes after the announcement on WWE Raw. Animal told hosts, Arda Ocal and Jim Korderas that the WWE was going to create a physical Hall of Fame in Tampa and he was going to donate his trademarked 'spiked-shoulder pads' to that Hall. On the July 20, 2012, episode of WWE SmackDown on Syfy, Animal returned to face Heath Slater in honor of Raw's 1,000th episode. He went on to squash Slater. He then reappeared on the actual 1,000th episode on July 23 with other WWE Legends to help Lita take down Slater.